This zesty dish comes together in the time it takes to boil water and cook pasta. I find that it's a good recipe to fall back on when the fridge is bare, since I almost always have these ingredients on hand. Feel free to use any mixture of herbs that you like; I used to make this with a small handful of basil, but now that I have sorrel growing in my garden, I often use that instead. While waiting for the water to boil, start the sauce. Pour in enough olive oil to film the bottom of a large sauté pan. Over medium-low heat, cook the shallot and garlic until soft and fragrant. Add the artichoke hearts, lemon zest and juice, white wine, and capers. Bring to a boil, lower the heat, and cook for about 10 minutes, until the liquid is syrupy and reduced by half. Stir in two-thirds of the chopped parsley and basil/sorrel. Add the butter and continue cooking and stirring until the butter melts and melds into the sauce. Season to taste with salt and pepper and keep on low until the pasta is cooked. 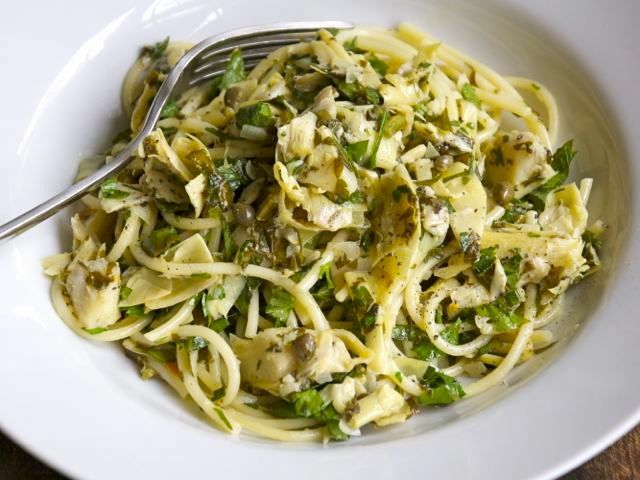 Once the pasta is cooked and drained, toss with the sauce and the remaining chopped herbs. If the sauce doesn't seem saucy enough to coat the pasta (this will happen if the sauce has been reduced too far), drizzle in a bit of olive oil and toss again. Serve with freshly grated Parmesan cheese.